Beng Mealea was built in middle of the 12th century, with later additions in the reign of the Suryavarman II with the style of Angkor Wat and dedicated to Hinduism. It is around 40 km due east from Angkor Wat. Take the road to Banteay Srie, but at the fork 2 km before Banteay Srei. Continue for 8 km and at the crossroads turn right. After another 26 km you reach a T-junction; turn left hear and after 11 km you reach the south gate of the temple. Enquire about the condition of the road before setting out; it may be impassable in the wet season and certain makeshift bridges may be unsafe. A total of 77 km from Siem Reap. Though unrestored and in a fairly ruinous state, the large temple of Beng Mealea some 40 km due east of Angkor on the ancient royal way to the “great Preah Khan” of Kompong Svay (another 60 km further on), is one of the major monuments of the classical period, in the style of Angkor Wat and roughly contemporary with it. Whoever built it must have been a figure of some importance, but he remains unknown, as no inscriptions have been found here, and no other that mentions it. 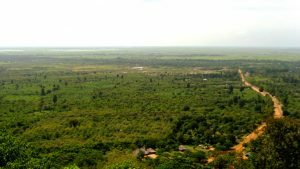 Its position was strategic, where the royal way to Koh Kerin the NE forks from the road E to the “great Preah Khan” and also at the head of a canal that leads directly to the Great Lake, down which sandstone blocks from the nearby quarries could have been floated on their way to Angkor. Its chaotic state, with collapsed galleries and towers (the central sanctuary is virtually a pit, with no superstructure whatsoever) may be due to a variety of causes. 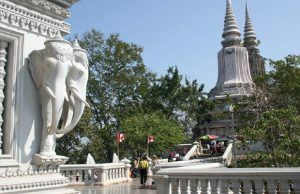 The most important is simply the wear and tear of eight and a half centuries in a tropical climate, with the spread of vegetation, including the silk-cotton tree and strangler fig, going to work on some ambitious vaulting which was being tried out here and at Angkor Wat for the first time. It is not known whether there was any iconoclasm, a possibility whenever there is evidence of different faiths practiced, as here. Happily, there is no evidence of recent looting. There is a considerable disorder, but very romantic for all that. Many of the early French scholars thought highly of this temple for both its architecture and its decoration. Coedes made a special study of its carving, and Groslier considered it to be a prototype, with a "harmony, powerful and sober". Its history is completely unknown, and it can be dated only by its style, which is of the mid-12th century. Beng Mealea was built of blue sandstone from local quarries, and while there are no narrative bas-relief panels as at Angkor Wat, there is a fair amount of decoration on walls and pilasters, all of a high standard, as well as amperes, lintels and few pediments. The religious history is also unknown, with carvings showing legends of Vishnu, Shiva and the Buddha. The temple marked the centre of a town, surrounded by a moat 1025m by 875m, and 45m wide. Four paved avenues lead via cruciform terraces to the entrances at the cardinal points, and it is oriented to the E. Directly to the E of the complex is a large bray, with a small island containing a shrine in its centre, as usual. In plan, Beng Mealea reminds one of Angkor Wat, though all at ground level with no temple mountain. There are three concentric enclosures, each one set back slightly to the west, with the central shrine at the intersection of the axes (and so the intersection of the town’s avenues as well). These enclosures are tied together with “cruciform cloisters”, just as at Angkor Wat, and in the NE and SE corners of the enclosures are shrines of the kind known wrongly as “libraries”. Also as at Angkor Wat, Beng Mealea has some impressive stone vaulting, and half-vaults that work as a kind of buttressing. Without the ample space that there is at Angkor Wat, all these interconnecting galleries would be confusing enough, even if the temple were in a restored condition. In addition, however, there have been additions, such as the raised causeways and probably the cruciform terraces, possibly also the two large galleried structures that fill the space between the second and outer enclosures on the south side. In its present state this last is a warren of stone and vegetation. Unlike Ta Prohm’s controlled “wild” state where the undergrowth is cut back, Beng Mealea is genuinely uncleared – the real thing for would-be explorers. You will need the services of a local guide, which is to say one of the villagers, and by the end of the visit you will be happy to pay for being taken around the tortuous route. 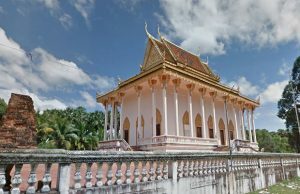 This involves clambering through small spaces and along roof tops, although in time this may become restricted as access comes under the control of the Angkor authorities. The state of the temple means that access is not by the obvious routes, and there are several ways of visiting. The route given here has been worked out by local guides, and shows most of what is interesting. Begin at the S gate of the outer enclosure, a short walk or drive from the road. Walk east along the outside of the wall to the SE corner pavilion. 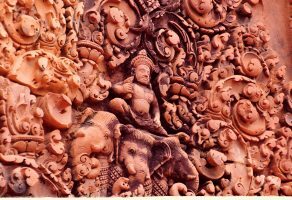 Here is excellent decorative carving on the walls, and a group of devatas, very clearly in the style of Angkor Wat, with stylized large folds of the sarong flying out left and right from above the belt. The expressions of these girls are particularly serene, and one is, unusually, cupping her bare breast (the guides never fail to point this out). Continue around the outside 'of the E side, to the cruciform terrace, raised on circular columns, with the remains of naga balustrades. The rearing five-headed nagas are magnificent and elaborately decorated, each with a proboscis and all tied together with a large, arrow-like halo. The route continues past the NE corner pavilion and round to the north side, where several metres beyond it is easy to clamber over. Here you face one of the raised “libraries”. Walk left around this to the end of the small raised causeway that connects it to the “cruciform cloister”. For once, it is possible to use a doorway, once through, turn right and head W into the second enclosure, following the ledge on the inside of the gallery. Enter the gallery of the inner enclosure a few steps S of the corner. On your left is the barely recognizable shrine and its vestibule, with a fallen lintel showing the Churning of the Sea of Milk. It is possible to walk around the upper part of the shrine, as the tower has completely collapsed. From here it is necessary to clamber southwards and up onto the roof of the N-S axial gallery. On either side as you walk there are views of the additional southern complexes. Descend to the left and enter a dark but impressive long vaulted gallery, running W-E along one side of one of these structures, exiting opposite the “library” of the SE corner. Turn right and you can climb out over the outer gallery. At this point, there is an unusual pediment over the door to your right, showing a god riding a rhinoceros. This is Agni, the god of fire, guardian of the SE, which accounts for his position in this part of the temple.